With all the craziness with the economy, planning a wedding, my best friend being in Iraq, having my family living on opposite Coasts, rodent roommates, work... I have found myself mumbling this mantra on a regular basis. I love this poster from Sparkle Power— simple, yet powerful. 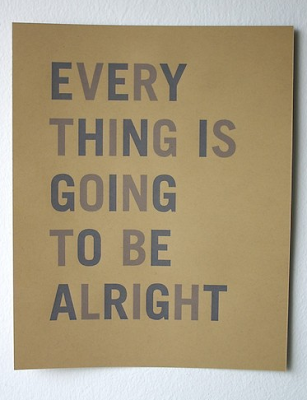 It's all about the law of attraction— "Everything is going to be alright." As a writer/editor, this poster would inevitably stress me out—arguably the opposite of what its creators are going for. I don't have a problem with improper grammar, so long as it's clearly intentional, as in the Southern version of this poster: "Ev'thing's gon' be a'ight."